There is good news for Rugby buy to let landlords as ‘top of the range’ well-presented properties are getting really decent rents compared to a year ago however, this rise in rents is thwarting many potential first time buyers from saving for both a deposit and money for a rainy day. On top of this, there is also a shortage of Rugby homes coming on the market thus adding fuel to the slowdown and affecting not just Rugby first time buyers but also those going up the housing ladder. Looking at the most recent set of data from the Land Registry for Rugby (the CV21 postcode in particular), the figures show the indifferent nature of the current Rugby property market. Rugby property values and transactions continue to be sluggish, and the monthly peaks and troughs of house prices and properties changing hands doesn’t mask the deficiency of suitable realistically priced property coming onto the Rugby property market, meaning the housing market is slowly becoming inaccessible to some would-be home owners. 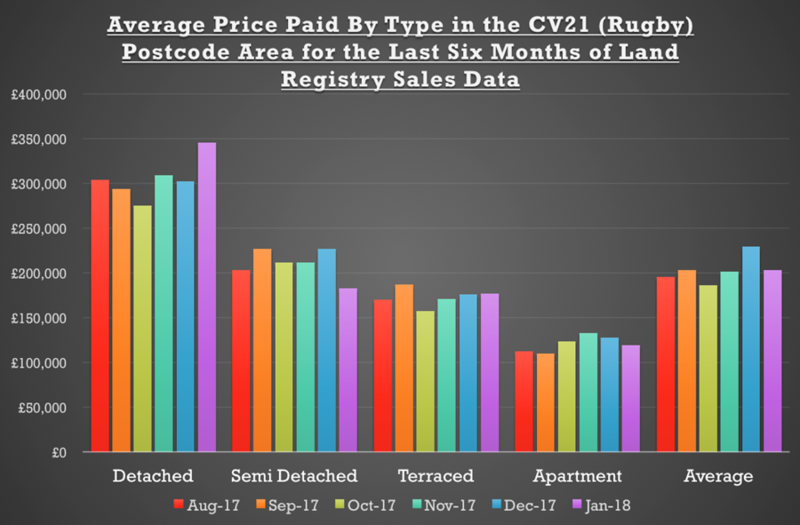 Looking at what each property type is selling for in CV21 (note the data from the Land Registry is always 4/5 months behind) makes interesting reading …. One must remember these are the average prices paid, so it only takes a run of a few expensive or cheaper property types (as can be seen with the variance in the Detached and Semi Detached in the table) to affect the figures.. Looking at the numbers of properties for sale … I looked at my research for early Summer 2008, and at that time, 919 properties were on the market for sale in Rugby.. and when I did my research on this article today, just 299 properties for sale.. a drop of 67%. The Government needs to seriously consider the supply and demand of the UK property market as a whole to ensure it doesn’t seize up. It needs to do that with bold and forward-thinking plans but, in the meantime, people still need a roof over their head, so as local authorities don’t have the cash to build new houses anymore, it’s the job of Rugby landlords to take up the slack. I must stress though, I have noticed a distinct ‘flight to quality’ by Rugby tenants, who are prepared to pay top dollar for an exceptional home to rent. If you want to know what tenants are looking for and what type of things you as a Rugby landlord need to do to maximise your rental returns – drop me a line. As we leave the memorably hot summer behind us, some interesting statistics have come to light on the Rugby Property Market which will be thought provoking for both homeowners and buy to let landlords alike. Over the last 12 months 1,258 households have changed hands in Rugby, interesting when compared with the 10-year average of 1,438 households per year. Yet, for the purpose of this week’s article, I want to discuss the pricing of the current crop of Rugby’s property sellers and the prices they are asking for their homes and the prices they are achieving (or not as at the case may be). It is so important for all property owners to know the real story, so they can judge for themselves where they stand in the current Rugby housing market, thus enabling them to make suitable and informed decisions… and that is why, in my blog about the Rugby Property Market, I pride myself in telling the people of Rugby the real answers, not just the ones they want to hear. The national average of homes selling at or above the asking price currently stands at around 10%, so around 90% go below the asking price – but by how much? Well according to Rightmove, in the Rugby area, the average difference between the ‘FINAL asking price’ to the price agreed is 2.5% … yet note I highlighted the word FINAL in the last statement. Well, you only get one chance of hitting the market as a new property. Everyone has access to the internet, Rightmove and Zoopla etc, and your potential buyers will know the market like the back of their hand. If you have a 3 bed semi that is on the market for a 3 bed detached house price.. those buyers will ignore you. Your Rugby property sticks on the market, potential buyers will keep seeing your Rugby property on Rightmove each week, then start to think there is something wrong with it, dismiss it even further, until you, as the house seller have to reduce the asking price so much (to make it appear inexpensive) to get it away. According to our own research, the average house buyer only views between 4 and 5 houses before buying – so don’t assume viewers will come round your optimistically priced (i.e. overvalued) property, thinking they will knock you down – no quite the opposite! Rugby Property Values 9.8% higher than year ago – What’s the PLAN to fix the Rugby Property Market? It’s been nearly 18 months since Sajid Javid, the Tory Government’s Housing Minister published the White Paper “Fixing the Broken UK Housing Market”, meanwhile Rugby property values continue to rise at 9.8% (year on year for the council area) and the number of new homes being constructed locally bumps along at a snail’s pace, creating a potential perfect storm for those looking to buy and sell. The White Paper is important for the UK and Rugby people, as it will ensure we have long-term stability and longevity in property market as whole. Rugby home-owners and Rugby landlords need to be aware of these issues in the report to ensure they don’t lose out and ensure the local housing market is fit for purpose. The White Paper wanted more homes to be built in the next couple of decades, so it might seem counter-intuitive for existing home-owners and landlords to encourage more homes to be built and a change in the direction of housing provision – as this would appear to have a negative effect on their own property. Yet the country needs a diversified and fluid property market to allow the economy as whole to grow and flourish … which in turn will be a greater influence on whether prices go up or down in the long term. I am sure every homeowner or landlord in Rugby doesn’t want another housing crisis like we had in 1974, 1988 and most recently in 2008. For planning to work, we need a robust Planning Dept. 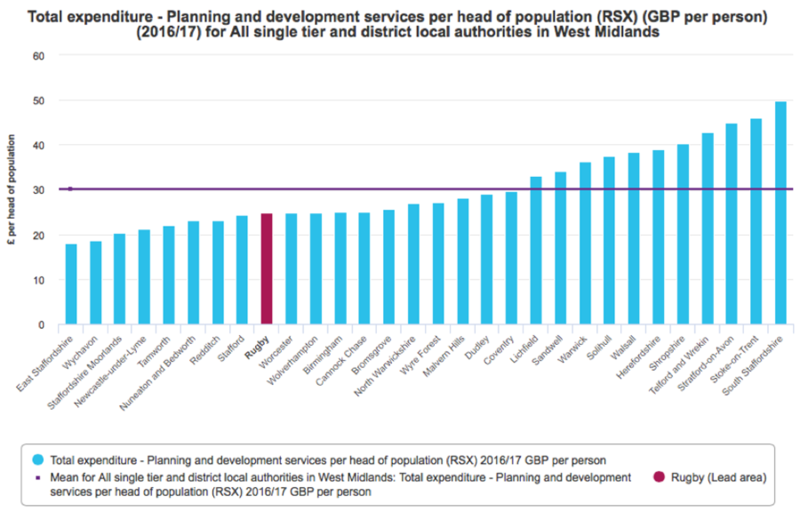 Looking at data from the Local Government’s Association, in Rugby, the council is below the regional average, only spending £24.72 per person for the Planning Authority, compared the regional average of £30.13 per head – which will mean the planning department will be hard pressed to meet those targets. 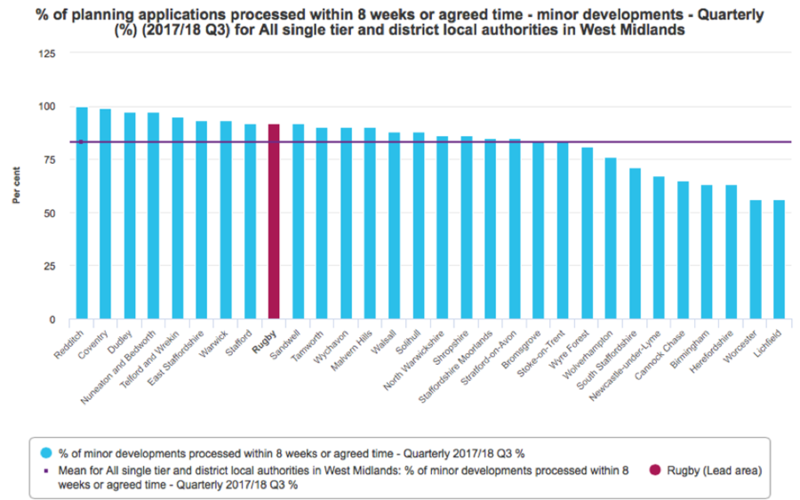 However, 92% of planning applications are decided within the statutory 8-week initial period, above the regional average of 83% (see the graph below). I am slightly disappointed and also pleased with the numbers for our local authority when it comes to the planning and the budget allowed by our Politician to this vital service. It won’t surprise you that 75,815 of 100,075 Rugby residents live in the urban conurbations of the authority, giving a density of 20.2 people per hectare (again – much lower than I initially thought), whilst the villages have a density of 0.8 people per hectare. Talking to a lot of Rugby people, their biggest fear of all this building is a lack of infrastructure for those extra houses (the extra roads, doctors surgeries, schools etc.). I know most Rugby homeowners and landlords want more houses to be built to house their family and friends … but irrespective of the density … it’s the infrastructure that goes with the housing that is just as important … and this is where I think the White Paper failed to go as far as I feel it should have done.